A while back I compared the 3 major music upload services by Apple, Google and Amazon. Amazon has just upgraded their service with an upgrade/match component similar to Apple’s iTunes Match, where it will attempt to match your music with their online library, thus eliminating the process of actually uploading the music file to their servers. Instead, Amazon will simply add your matched music to your library using their online archive, preventing the long process of an upload. First Impressions: There are some technical differences between the two services. While both are $25/year, iTunes Match limits you to 25,000 songs, while Amazon limits you to 250,ooo songs, a 10x difference, plus you get 50gb of storage on their Cloud Drive service. Also, while Apple only allows you to stream your music from an iOS device or thru iTunes, Amazon’s Cloud Player lets you listen to your entire library via web browser or iOS/Android apps. Apple’s service is more of a cloud locker and you do not have direct access to your files per se, they are ‘in the cloud’ somewhere, whereas you can view/edit/download Amazon Cloud Player files. This is a BIG issue. I have a large collection of CDs and they are all ripped into Lossless format. If they cannot be matched, there is no upload, so basically you are out of luck unless your files are in MP3 or AAC format. It seems that the service will also scan WMA files on Windows, but I am usure if it will upload those or not if it cannot match them. I attempted to convert the offending files to MP3 in iTunes and scanned the same directory, but the upload app would not recognize the new songs, even after a restart. I ended up copying the converted files to another folder, and then Amazon was happy to find and upload them to the cloud. This is a huge advantage from Apple since they automatically handle such issues for you. This really needs to be addressed by Amazon. If you do not have any lossless files in your library, this should no be an issues, and for the price, it looks like the Amazon service is a better deal that Apple’s unless you are strictly OSX and iOS and do not need to access your music from anything other than your own devices. Amazon ‘Match”: I uploaded an album from ABC, ‘Beauty Stab’ that was 192k and had some scanned artwork. Amazon matched the entire album, then I did a download, and sure enough I was given 256k MP3 files in return. However Amazon did use their album art, but did keep my custom album naming and other tags. Not a huge deal, but be aware that on matched files you may not get back exactly what you uploaded. Apple saves your tags and album artwork from your file. If there is a mistake on the matching, Amazon has an option to correct the upload/match. Some of my old Billie Holiday tracks from the Columbia years were matched, but what I got back were not the same remasters, but obviously the same recording from a different source. This is probably not an issue except for really old music. Amazon has a ‘Fix Incorrect Match’ option on the matched tracks in your library, allowing you to upload the originals instead of using their matched version. 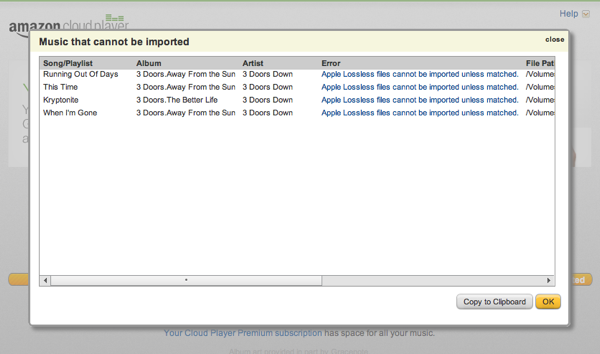 This is a really good option, and one that iTunes does not offer. Again, not a big deal, but a helpful choice for that odd track that gets matched incorrectly. 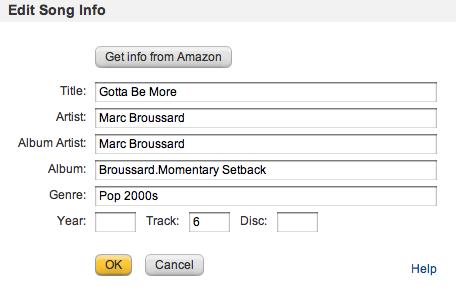 Amazon has added the ability to edit the tags on your music, something that Google Music has had for a while. I selected one track and was able to change some info, however it refused to save the changes until I filled in all of the fields. This could be a pain, since they ask for Year, Track and Disc along with other basic info, and if you do not know it you have to put some dummy info in the fields. This messed up my track order on one album, since the Disc Number tag was not set on any of the other tracks, and therefore the edited track appeared at the top of the album listing. I was able to select the entire album and set the Disc Number to blank, and Amazon accepted that with no problem. There is an inconsistency issue here, but hopefully this will get worked out since this is a new feature. The Amazon Match service looks promising, but there are a few things that should be addressed. Besides the Lossless File issue, Amazon does not really tell you what it had done concerning matched/uploaded files. While there is a new menu item for ‘Upgraded Tracks’ which are tracks less than 256k that have been upgraded, you cannot tell how the other tracks were handled, ie. uploaded/matched. You can click on the menu item for an individual song and if there is the ‘Fix Incorrect Match’ option you know it was a match, but there is no library-wide column or other indication of the status of tracks. Yes this may be a little OCD, but I do like to see what is going on, and iTunes tells you whether a track has been matched, uploaded, a duplicate or ineligible for upload. I have a large library and it is enough work keeping track of what is in iTunes Match, Amazon Match and Google Music. Yes, I use all 3 services, and there are little problems with all of them, but nothing that is a deal-breaker other than Amazon’s Lossless issue. Overall I am happy with Amazon’s new service, although their continued insistence on having a ‘Suggested Music to Buy’ panel on the right of the Web Player still annoys me to no end. Yes, they did change their free unlimited music option on Premium accounts to 250,000 tracks, but really that is more than enough, and they upped the Cloud Drive storage to 50gb, so I may actually use it now. FYI the ‘free’ service offers only 250 songs other than Amazon MP3 purchases and a 5gb Cloud Drive, so if you are looking for free, Google’s 20,000 Play service is the way to go. No matching there, but as a service it does have a edge over Amazon, so worth checking out.